Hull mum Anna is helping me keep the Mumbler website up to date and is going out and about with her baby Dan to try some new activities. Last week she went along to check out the Us Mums bootcamp session and wrote a review about her experience…..
I’m a first time Mum and prior to having my baby last August I enjoyed an active lifestyle, walking my dog and even getting into running taking part in a 5k fun run. Due to my baby being breech I opted for a planned C-section so found it took a few weeks after having my baby to get back to being able to move about and going on little walks which was a bit of a shock to my system. 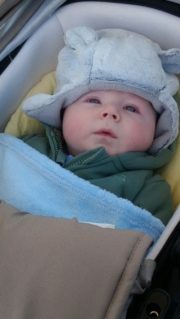 I came across Us Mums on Mumbler when first exploring groups to join when feeling I was ready to get out and about with my baby. 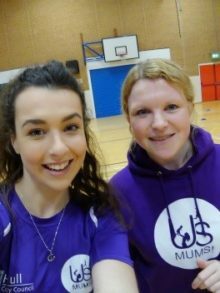 Us Mums looked ideal as your able to take your baby with you whilst you work out, all sessions are designed for pregnant ladies and/or post-natal and are held throughout Hull and at various times during the week. For safety you need to ensure you are post 6 weeks natural or 12 weeks C-section before joining a session. 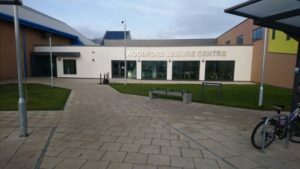 After looking through the timetable I filled out a really simple registration form and put my name down for Bootcamp at Woodford Leisure Centre in East Hull, by 12 weeks I was keen to start getting fit and feel more like the old me again! My regular instructor is called Laila and from contacting Us Mums prior to my first session she was really encouraging when enquiring about groups, prices etc and I felt really welcome at my first session. This week the class was run by Lauren, here we are at the session! Bootcamp is based on Interval/Hit training so you do 30-60 seconds short blasts of strenuous exercise such as squats, lunges, lifting small weights etc then have a short rest before moving on to the next exercise. I find you work up a really good sweat but the hard work and ‘burn’ only last for a short time before a breather and water break! The session lasts 45 minutes including warm up cool down and each exercise has various levels of difficulty so can be tailored for anyone. The instructors are friendly, welcoming and explain things really well ensuring you do the exercises correctly to protect you from any injuries and get maximum gain from your workout. Obviously a major plus for new mummies is the fact you can take your baby with you, at any point in the session you can stop your exercise to tend to your baby, feed, change them etc. There are play mats and toys laid out in the middle of the room for your baby to have a wriggle on with other babies and so you can keep an eye on them easily. If needed you can carry your baby with you during the session and the exercises can be adapted to be enable you to continue working out whilst holding your baby, I see it as a bit of extra weight lifting carrying Dan about! Whether it’s squats, lunges or putting Dan on a mat whilst doing planks or mini push ups, he seems to be highly amused at watching mummy sweat and loves being rocked about! My baby is now a 5 month old wriggler who’s just learnt to roll but is still fairly ‘non-mobile’ as some sessions are for non-mobile only babies, Us Mums do have crèches for some sessions if your wriggler starts to pick up speed which will come in really handy in the future when little Dan makes the ‘mobile’ mark! I’m now attending two Bootcamp sessions a week, Woodford Leisure Centre on Mondays and St Marks on a Thursday. Both are excellent facilities and are in handy locations. The session at St Marks is £2 and £2.45 at Woodford so really good value for a morning out and exercising! I really look forward to the sessions, feeling I’m doing something ‘healthy’, being able to have chat with other mums and after the session you have a feel good mental boost which I’m sure mummies can appreciate when trying to get back to feeling normal and deal with little screamers! I’d recommend Us Mums to any ladies looking at getting more active, they do a variety of fitness sessions including yoga and aqua natal, all really well priced and flexible to you. I rate them 5 stars all round! You can find the latest Us Mums timetable on the Mumbler Fitness for Parents section.